The problem: the binding agent, or lack thereof, caused the mixture to break down into crumbles. Although this is dandy for other recipes– dolmes, sausage casserole, and stuffed peppers come to mind– we really need something for Scotch eggs that will hold together well enough to wrap around a hardboiled egg. The problem is that most binding agents come with their own flavors. Since this mixture tastes and feels almost perfect, we don’t want to alter the flavor or texture palate to a huge degree. We thought of a couple of possibilities. – Regular wheat flour seems the obvious choice, but we’re concerned about how it might affect the flavor and texture. – We could try some egg, but since the recipe is based on hardboiled eggs, we’re worried it’ll be too eggy. We ransacked the pantry, and found a couple of items we thought might fit the bill: soy flour and gluten. We divided the remaining batter from the original batch and measured soy flour into one and gluten into the other. Since we’re still in the development stage, our measurements were fairly inexact; mixing was performed by hand and enough of each substance was added to better bind the batter (say that five times fast!). The results of both were fairly underwhelming. The soy flour gave the sausage a “green” flavor, like we’d mixed in edamame. Blech. It also didn’t hold together well enough. Better than the original batch, but not well enough to wrap around an egg. The gluten held together wonderfully, but imparted its own flavor to the mix that almost overwhelmed the sausage-ness. In fact, the mix which included the gluten tasted almost exactly like the fake sausage brand we buy at the store. So, we know how they do that, but we’re trying to avoid the flavors of store-bought veggie sausage. Gluten won’t work. Frustrating! But now’s not the time to quit, not when we’re close enough to taste that Scotch egg and its tangy intersection with HP sauce and our bellies. So, what next? Of course, this will have to wait until we can afford to run out and buy some new ingredients, so it’ll likely be next week before we post the next installment. If you’ve been following along so far, thanks a mil! And, if you’d like to help support this project, check out Meat/No Meat: A Cookbook for the Biculinary, and maybe consider becoming a backer! 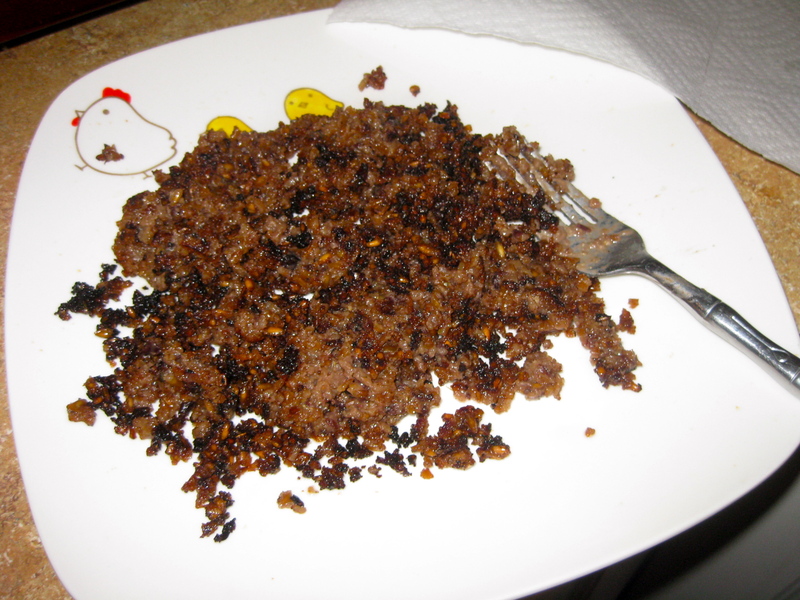 In our quest for the perfect vegetarian sausage, we decided that a base of bulgur wheat mixed with black beans should pretty closely approximate the “mouth feel” of ground pork sausage. So, to start our first test recipe, I decided to cook 1/2 cup of bulgur wheat and mix in a cup of black beans, which will give us enough of a base to stretch out through a couple of test sessions. Every step in the process will eventually contribute to the final flavor. With this in mind, and because I’m not a fan of cooking grains in plain old water, I decided the wheat needed to be simmered *in* something. What might add an earthy, slightly bitter complexity to the grains? Vegetable broth would be too sweet, and not quite on the mark in the flavor category. How about…. coffee? Sounds strange, right? But coffee has a nuttiness that I think just might work in the final product. So, one cup of brewed coffee and 1/2 cup of bulgur wheat into the pot, boil and then simmer for about 15 minutes, and step one is complete. Upon tasting the cooked grain, I did think the coffee flavor was a bit too strong, but a quick rinse under cold water in a mesh strainer mellowed the excess flavor. Although in the last post we thought we might try powdered milk as the binder, the store was out of it. They did, however, have this lovely canister of powdered *buttermilk*, featuring this handsome, red-cheeked chef of vaguely European mien. His charming smile all but called out to me in mock Italian: “Hey, you! Forget about powdered milk, try-a my powdered buttermilk, capice?” Why not give it a whirl? The sournesss of buttermilk might add something traditional vegetarian sausages miss, and anything with butter in the title can’t be that bad, right? I added the buttermilk, measuring as I went, and it seemed to be working wonderfully. 1/4 cup did the trick. I then added a combination of other ingredients to approximate that inimitable sausage archetype. Since this is a test recipe, I’m not going to provide their exact measurements here, but I will tell you that I used soy sauce, sage, thyme, nutmeg, pepper and salt. A quick taste let me know I was on the right track. Flavor seemed right. Consistency seemed right. So, it was time to toss some of this stuff into the old frying pan and see who saluted. Since our eventual goal is something that will be deep-fried, we need to know that a) it won’t cook too unevenly in oil; b) it’ll hold together if wrapped around an egg; and c) it will taste delicious. To that end, I decided to make a few patties out of half of the mixture and fry ’em, leaving enough left over to muck with if the first batch didn’t work. I put about 1/4 cup of Canola oil* in the pan and turned that sucker up to 7.5 (out of 8). When it had a nice sizzle, I spooned in three patties of varying thicknesses and let ’em have it! As the mixture started cooking, it really began to develop a distinctly delicious sausage-like smell, a perfume you’d imagine wafting from the kitchen in a Southern grandma’s house at breakfast time. True fact: when Emily came into the kitchen, I asked her whether she thought it smelled like pork sausage. Her reply? “That’s not real sausage?” I was on to something. Then it happened. Before my eyes, the lovely little patties I’d created began to break down into crumblies. I tried to hold them together, to retain their shapes as I inserted the spatula under each one. They simply weren’t holding together. Part of the problem was the condition of our little frying pan, to which even the oiliest ingredients will stick like evil glue. However, I believe that what was happening was that the buttermilk was breaking down and absorbing the liquid as the sausage cooked, losing its consistency and causing the patties to crumble. The flavor, the mouth-feel, the texture, are almost exactly identical to country-style pork sausage. The ingredients as used, in the proportion they were used, were nearly perfect. It was slightly salty, so I’ll need to cut down on that just a bit, but otherwise it tastes closer to real pork sausage than any store-bought substitute I’ve ever tried. I sincerely doubt that a meat-eater would even be able to notice the difference if unaware. We mixed the crumbles into a tomato sauce and served over butternut squash ravioli, and oh my goodness, you guys! This stuff is REALLY, REALLY GOOD. Still, it’s not quite ready. It just needs one more something that will help it stay together as it cooked. What would that something be? Tune in shortly for the exciting conclusion and find out! And don’t forget to visit our Kickstarter page and help support this lil’ project! *It’s always tempting to use olive oil, but don’t forget that olive oil has a flavor. I don’t want that flavor in this dish, so to the Canola I went. If, of course, we manage to raise the funding. Visit our Kickstarter Page for more! Let’s say we’re interested in making a vegetarian version of Scotch Eggs, those delectably delightful staples of British Pub Food, hardboiled eggs wrapped in pork sausage and deep fried. We could always pick up a package of prefab vegetarian sausage substitute– Lightlife’s Gimmee Lean certainly fits the bill, even though it’s sticky and difficult to work with. However, in the interest of the Meat/No Meat philosophy, we want to figure out our own version. So, let’s think about sausage. The kind we use is country style, which I suppose we could categorize as “plain sausage”: think Jimmy Dean, breakfast patties, salty, juicy goodness. (We don’t want anything too exotic at this point, since we’re just making the basic, so no chorizo (yet)). The best kind is, of course, fresh, purchased from a butcher shop or other purveyor of ground, spiced pork, especially since Jimmy Dean usually has copious amounts of MSG and nitrates, which many find categorically yucky. Typical sausage seasonings usually include sage, maybe some thyme, nutmeg, perhaps a couple of fennel seeds tossed in for good measure. When we think about our vegetarian version of sausage, we want to compare it to the pork version. Pork sausage is slightly crumbly, moist, fatty, salty, juicy. 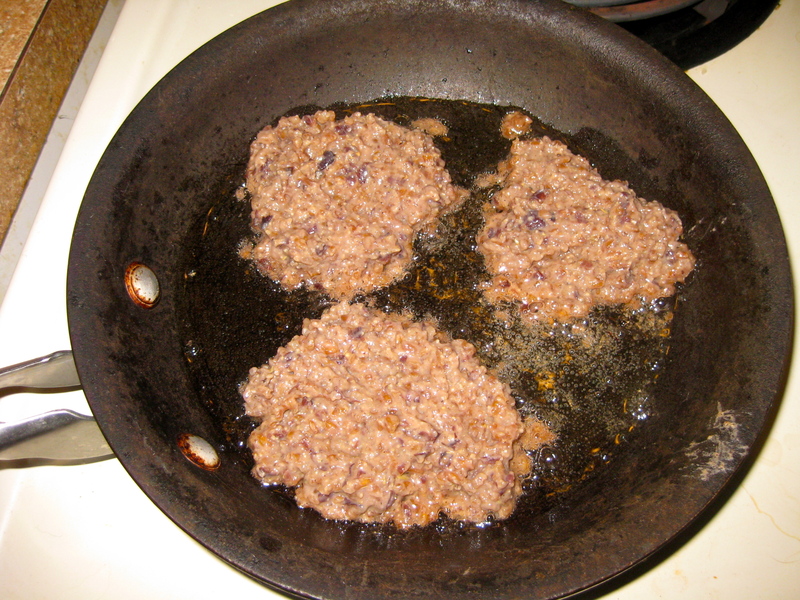 It isn’t usually consistently textured; in with the ground meat we usually find little pockets of gristle and grease. This is a big difference between store-bought veggie sausage substitutes and the real thing. The kind we find in the store is often smooth and pasty. For our version, we’ll need some kind of base. Since we want to come close to the texture of the real thing, we’d like to have at least two components to our base, a main ingredient and a secondary. We think crumbly, moist, so a grain of some kind– perhaps quinoa? It would do the trick, especially since once it’s cooked it can be mashed and has an interesting mouth feel. But alas, the store we visit is out of quinoa (only in Seattle) so we need some other possibility. Looking around, most of the other grains are too large to work. Amaranth is a possibility, but it’s kind of obscure, and would need to be ground further at home. We settle on cracked bulgur wheat, familiar to most people from tabouleh. What about the second ingredient? We’ll want less of it, and it should be interestingly textured and readily mash-able. How about beans? Black beans have a nice, meaty flavor and would add some proteins to the mix, so we’ll go with a can of those. Now we need something that, when mixed with liquid, will bind it all together. The problem with many of the usual binding agents– flour, for instance, is that they have a bad habit of drying out whatever you’re trying to cook. Since Scotch Eggs are deep fried, this is an even greater concern; we don’t want our sausage substitute to turn the egg into a crispy asteroid with a sandy interior. We need something that will help retain moisture. We also want to add some kind of fat to the mixture. This could be oil, but we are going to fry them in oil, so we run the risk of a final product that’s too oily. It could, theoretically, be butter. We can try these as possibilities, but let’s explore other options and think outside of the box a little bit. What kind of binder could both hold our veggie sausage together and add a little fattiness and sweetness to our sausage? How about powdered milk? It’s sometimes added to pork sausage for the exact same purpose, so let’s give it a whirl! Now we’ve got the basics for our first test batch of veggie sausage: bulgur wheat, black beans, powdered milk. We’ll use water and a little soy sauce as our liquid, since soy salt adds a little saltiness. For seasoning, we’ll use sage, thyme, savory, nutmeg, salt and pepper– traditional sausage spices. In the next installment, we’ll whip up our first test batch and see how it goes. We are writing a cookbook for the Biculinary: Vegetarians and Non-Vegetarians, called “Meat/No Meat.” Instead of many vegetarian recipes, which simply substitute fake meat products for the meat found in standard concoctions, the recipes in Meat/No Meat are designed to duplicate the edible experience as closely as possible for both vegetarians and non-vegetarians alike. We won’t be using expensive, sometimes hard-to-find fake meat you need to buy at the store; instead, we will be creating tasty substitutes with ingredients found in most major supermarkets. Alas, our kitchen equipment is sore lacking, so we are trying to raise $3,000 in seed money to help replace some old pots and pans, and to augment the food budget so we can perfect and refine the recipes. To that end, we’ve started a Kickstarter page where interested parties can back our project. Help make our dream a reality– vegetarians and non-vegetarians can eat together at the same table at last! On the left, collard greens made with salt pork. On the right, collard greens made with eggplant “salt pork.” Can you tell the difference? Help support Meat/No Meat today! This year, due to lack of the usual guests, my wife and I are taking a break from the bird and cassarole &tc. Instead, we’ll be making a couple of dishes from scratch that we’ve always wanted to make, but never have for whatever reason (timpano and cannoli, for those who are curious). If you’re interested in eating a succulent and mouth-wateringly flavorful turkey this Thanksgiving, you should really consider brining that sucker! It’s very easy, and the payoff is high-quality bird that’s absolutely shockingly delicious. 1. Make sure your turkey is clean and completely thawed! 2. The night before you’re going to cook your turkey, place the bird in a massive container, big enough that the turkey can be completely covered by the brine. 3. Begin boiling your water in a stock-pot. You can also use a number of smaller pots if they’re all you have on-hand. 4. When the water reaches boiling point, turn off the heat and begin adding salt to the water. You’re going for a ratio of about 3/4 of a cup per gallon of water. If you’d like to check whether the water is salty enough, drop in a raw egg (in the shell). Does the egg float? If so, you have plenty of salt in your brine. 5. Add your boullion cubes, about two per gallon of water. Add your teabags. Add whatever other spices you’d like to seep into your turkey. I like some rosemary, some sage, some pepper. Add enough spices that the brine gives off a heavenly aroma. 6. Turn off the brine and (this is important) LET IT COOL DOWN! If you’re in a hurry, you can drop some ice-cubes into the brine, or put your stock-pot in a sink full of ice, or stick it in the fridge, but it’s best to just let it sit and cool off, which takes a while. It has to cool off because you don’t want to start pre-cooking the bird! 7. When the brine is cooled to room temperature, pour it over your turkey. Cover it completely. 8. Let it sit, in the fridge, for 8-12 hours (but not too much longer or it’ll get too salty). 9. When it’s done brining, remove the turkey and wash it off. Discard the brine. 10. Preheat the oven to 450 degrees. 11. Melt the butter on low, and soak the cheesecloth or towel in the butter. 12. Stick about six garlic cloves underneath the skin of the turkey. Place the bird on the roaster, and cover it with the butter-soaked towel. DO NOT STUFF YOUR TURKEY. Cooking your stuffing in the turkey causes problems. It makes the cooking time all wonky and you run the risk of cold stuffing in a hot bird, which is just gross. 13. When the oven reaches 450, put the bird in for a half-hour. After the half hour, take out the bird and cover it *LOOSELY* with a sheet of aluminium foil. Reduce the heat to 325, and place the bird back in the oven. 14. Baste your bird frequently. Once every half hour should do fine– don’t do it too much or you’ll interrupt the cooking process. This sounds pretty frequent, but if you remember to baste it eash time you go into the kitchen to refill your wine glass, you should be okay. 15. (Optional) If you would like to put a mild glaze on your turkey, here’s a neat one. Mix together about 1/2 cup of honey and 1/4 cup of tamarind syrup with a couple of teaspoons of olive oil. Coat the turkey in glaze about 45 minutes before it comes out the oven. Glazing isn’t imperative, but it can add some extra crispiness to the turkey skin. 16. If you have a meat thermometer, remove the bird when it reads about 180 degrees in the leg joint. It should take anywhere from 3-6 hours depending on how big your bird is. You can estimate an hour for every three pounds or so. Another way to check for done-ness is to stick a fork in the thickest part of the turkey. Are the juices clear? Then your turkey is done! Enjoy your deliciously brined turkey, and impress your friends and family with your mad brining skills! I saw this nifty little trick done on No Reservations when Bourdain went to Rome, and had to give it a try. Imagine a delicious taco salad in a hard shelled bowl, and now replace the taco salad with spaghetti and replace the bowl with CHEESE! That’s righht– BOWLS MADE OF CHEESE! First thing’s first, grate your wedge of delightful, high quality parm, and mix in about a tablespoon of crushed black pepper. You could theoretically use any hard cheese (Asiago, Pecorino, Romano, etc. ), but since this was the first try, we’ll do the traditional. I’d pick up a medium-sized wedge, but you could use as much or as little as you’d like, depending on how thick you want the bowl. Just remember not to overdo it, or it’ll never harden. By the way, if you do a lot of grating, I cannot recommend investing in a rotary grater highly enough! Give it a little time on the stove, but don’t leave., and don’t stir the cheese. You want to keep an eye on it and watch for the very moment that the grated cheese melts together into a solid ‘pancake,’ but you don’t want it to get too liquidy and run off of the mold. Now comes the tricky part: put your bowl mold into the center of the pancake, and flip the whole thing over. The cheese should drape over the bowl, remaining after you’ve removed the crepe pan. You may need to shape it manually a little, but as long as the basic shape is there, you’re golden. Next, put your cheese-covered bowl mold into the fridge, and leave it for at least an hour. If all worked well, after the hour is up, you can remove the mold, and you’ll have a really nifty, quite impressive bowl made of cheese! How frickin' cool is that? Fill with anything that suits your fancy. The only caveat is that the bowl is made of cheese, so if it gets too hot it’ll melt. I wouldn’t recommend serving a hot marinara or anything. We just drizzled some olive oil over some spaghetti, tossed in a few olives and some fresh farmer’s market tomatoes, and topped with (of course) more cheese. This would also be an excellent— and impressive– way to serve salad at your next function. Make some parmesan cheese bowls today!